In respect of fragments 80 and 112 I have suggested that it is incorrect to interpret πόλεμος simplistically as ‘war’, strife, or kampf  and that, instead of using such words, it should be transliterated so as to name a distinct philosophical principle that requires interpretation and explanation with particular reference to Hellenic culture and philosophy. For, more often than not, such common English words as ‘war’ are now understood in a non-Hellenic, non-philosophical, context and explained in relation to some ideated opposite; and in the particular case of the term ‘war’, for example, in contrast to some-thing named, explained, or defined, as ‘peace’ or a state of non-belligerence. I contend that fragment 1 also suggests a denoting, in the sense of expressing some-thing by denoting it or describing it by a ‘name’. That is, that λόγος here does not refer to what has often be termed Logos, and that the ‘ambiguous’ ἀεὶ  is not really ambiguous at all. Although this naming and expression [which I explain] exists – human beings tend to ignore it, both before and after they have become aware of it. 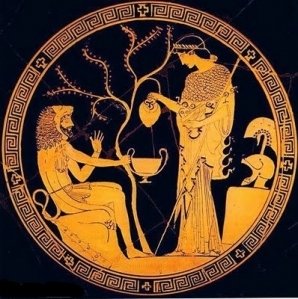 The ‘which I explain’ is implicit in the sense of λόγος here as a naming and expression by a particular individual, contrasted (as often with Heraclitus) rather poetically with a generality; in this instance, contrasted with human beings – ‘men’ – in general, and with “tend to” modifying the sense of ἀεὶ from the strident, bland, ‘always’ to a more poetic expression of human beings having an apparently rather irreconcilable tendency – for now (at least) and certainly as in the past – to ignore (or forget or not understand) certain things, even after matters have been explained to them (they have heard the explanation) and even after they have discovered certain truths for themselves. θεοί – and Μοῖραι τρίμορφοι μνήμονές τ᾽ Ἐρινύες – permitting I may in the not too distant future endeavour to translate/interpret the rest of the fragment. Acknowledgements: The genesis of this article was a personal reply sent to Aymenn Jawad Al-Tamimi of Oxford university, in response to questions concerning ἀεὶ and my rather idiosyncratic interpretation of the first part of the text of fragment 1.